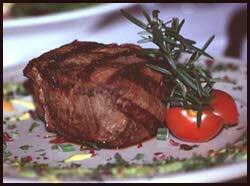 Elk meat is not only tasty, but is lower in fat, cholesterol, and calories than "traditional" red meats. For this reason, the demand for elk meat is increasing among health conscious consumers. Venison consumption in the United States, which includes elk meat, has more than doubled since 1992. Retail prices of elk meat are higher than those of beef. According to the Saskatchewan Agriculture and Food Department, elk meat retail prices range from $2.00 per pound for trim meat to $18.90 per pound for tenderloin. The American Elk Products Board (AEPB) has addressed food and product safety issues through its Quality Assurance Program. This program promotes practices that yield products which are free of growth hormones, antibiotics, and other substances that are not natural.